I have already written a review of the Alexander McQueen exhibition. It’s stunning. As ever, when you see a body of work, however it is displayed and arranged, you cannot help but be in awe of the productivity of an artist like Lee. Every season he brought brand new ideas out of the hat. Scottish oppression, Nigerian voodoo, Japan v America chess game, Birds of Prey, American football, Chinese embroidery, Jack the Ripper. You can see some stunning clothes here – works of art made from leather, hessian, appliquéd silk, horsehair, feathers, microscope slides, razor clam shells. There is atmosphere – a Cabinet of Curiosities allows you to sit for a while and watch the catwalk shows, see a selection of accessories close up and take in some of the garments, neatly displayed in cabinets. Here is the dress that was painted live, as the finale to the SS 1999 show, by robots more familiar in car assembly plants. 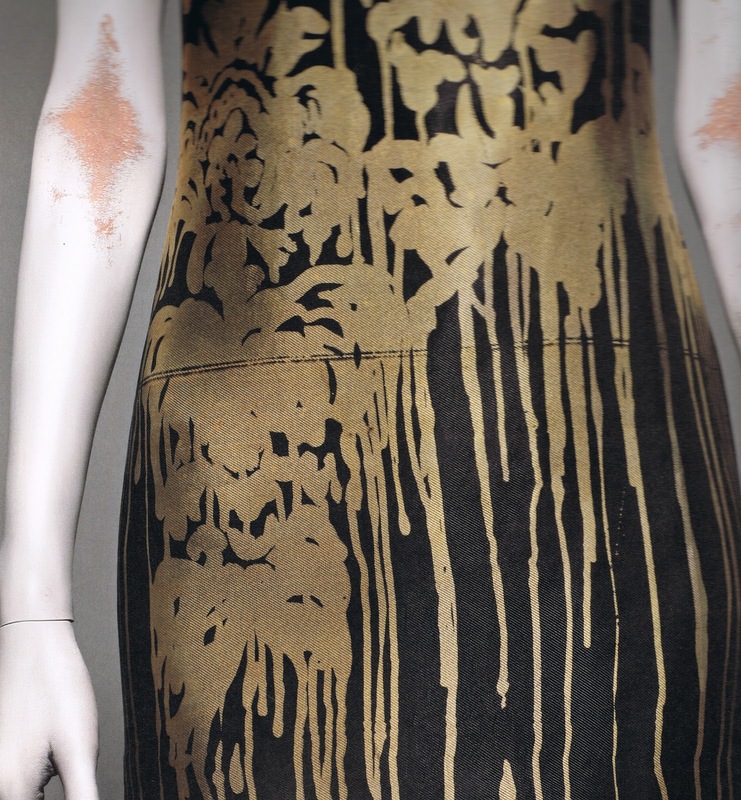 This post focuses specifically at use of individually printed fabrics used by McQueen in the very early days. While his later work is stunning I must admit I was especially interested in the very innovative approach adopted by Lee in the early days. He was living in a Council flat in Tooting after he qualified at Central St Martins and had virtually no income. He put the S/S 1996 – The Hunger – collection together for just £600. Many people describe how they were drawn to work for him – initially for virtually nothing but the gift of clothes – including a publicist, a runway show stylist – Katy English, and a textile designer – Simon Ungless. His poverty also drove him to use all sorts of materials for his first proper collection – Taxi Driver – flameproof curtain linings, bird feathers from plucked pheasants, and various items from builders merchants such as latex. Unfortunately there are no items preserved from this collection. Stuffing the clothes into black bin bags he and Simon went for a celebratory drink, leaving the bags outside a Soho pub. When they came out the bags had gone. The S/S 1995 Birds show included a number of outfits – one or two on show at the exhibition – made in white cotton over which an inked car tyre was used to print it with Indian ink. 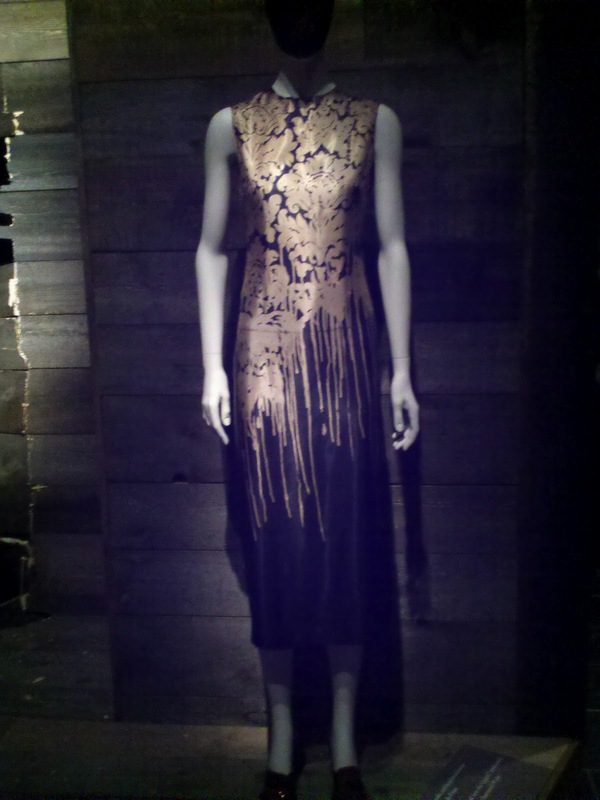 I was also fascinated with another dress in the exhibition. It is calf length, made from slightly shiny black silk. 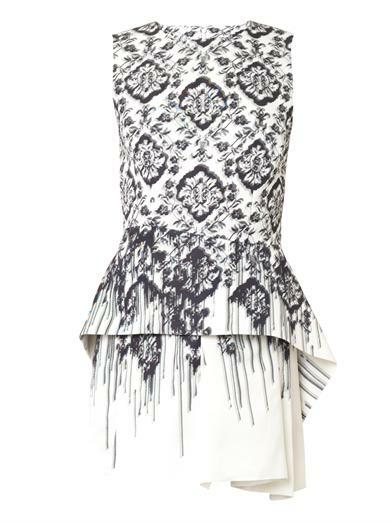 On the front, applied after the dress has been stitched together is what looks like a damask design screen printed or painted on to it, which has then been hung up so that the ink dripped towards the hem. It may have been done digitally, but I have held this dress in my mind since I first saw it and wondered if I might make a version of it. Here is a close up. As an idea I find it fascinating – the gold ink looks molten, almost like sealing wax. The very regular damask design – a lovely classic pattern that works so well in strongly contrasting colours – then degrades as it trickles down the models’ thighs. I am wondering how to capture this design – I like damask very much – as a screen, block or batik print. Here is modern RTW item from the company, using the same idea but in a mass-produced way. Of course later on Lee could use the most sumptuous cloth and custom printed fabrics of the most exquisite quality. But for me the early experiments and innovative approaches, using cheap everyday materials, are the most interesting. The London exhibition, currently on at the V&A, has the prologue that has been added to the pre-existing New York collection. Katy English contacted lots of the people who were there at the start and asked to borrow back items and garments Lee had given away. The tailored jackets on show were collected from his older friends, and some of the rougher elements (made by McQueen at home on his sewing machine, with unfinished seams from cheap fabrics) tell us more of the story than the highly stylised pieces from the days when he was at Givenchy. I seem to have lost some of my followers who thought I had just gone on holiday. I will have to try to find them or hope they can find me. It is to do with changing the name of the blog…. Exactly what drew me, and many more to this exciting designer. Love that molten dress and hope you can give it a go. Grace’s thoughts (having done lots of different printing) is that batik might work best. We’ll look forward to seeing your results. We watched a recording of the Voice last night and I loved Emma’s top – I’m on the look out for a pattern similar. Off to buy lining today so I can finish off the skirt!